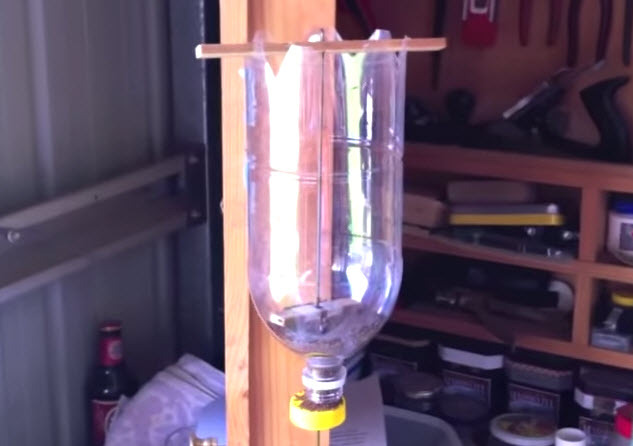 Make a food dispenser that your fish can operate! Get a plastic bottle, cut off the bottom of the bottle, and make jagged cuts along the edge. Cut a piece of wood to fit over the top of the bottle and a second piece to fit inside, and drill a hole through the center of both pieces. Thread a wire through both pieces of wood, and twist the wire at the top to hold it in place. Get a plastic bottle top that is for a larger bottle than the one used for the dispenser, and drill a hole through the center of the cap. Put the wood pieces in place on the bottle, consider using aquarium silicone to hold the wood in place, and thread the cap onto the base of the wire. Pour pellet fish food into the bottle, and attach the bottle over your tank. Consider attaching a straw onto the base of the wire to make the wire longer so that the plastic will be in the aquarium rather than the wire.